It’s time. This year I’m taking up the challenge and joining the Australian Women Writer’s Challenge, to read a certain number of books by female Australian authors and review them. 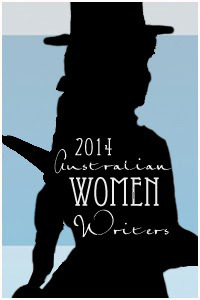 When the challenge was first announced two years ago, I have to admit to being somewhat perplexed by it all – who wouldn’t read Australian Women Writers? I checked my bookcase, half full of Australian author’s with Isobelle Carmoday and Kate Forsyth probably the best represented on the shelves, but Lian Hearn and Nikki Gemmell also make repeat appearances. Julia Leigh, H.F. Brinsmead and Sally Morgan can be foundand on closer inspection, I was surprised to find other female writers on my shelves were also Australian – Kylie Ladd and Geraldine Brooks for example. So why the need for such a challenge? Clearly, my bookshelf is not the norm. These studies (VIDA, CRIKEY) show that women writers are often far behind in terms of their books being reviewed by major publications. (Though I was pleased to see that one of my state’s newspapers – The Sunday Tasmanian – has an almost equal representation of male and female authors – go Tassie! 😉 ) But The Australian Women Writer’s Challenge is getting the word out, and the reading and reviewing of books by Australian female authors is on the increase. So this year, I thought I’d join in. I’m setting myself an easy challenge – a mere 6 books for the year. And I’m aiming to read a particular genre – historical fiction, with a focus on those that cover convict/colonial times. It’s research, in a way, for I have my own novel in the works, one for which I have lots of research planned, and hopefully with my reading I’ll have more of an idea of what’s already out there. I can’t tell you too much about my own tale yet – though the main character is a Scottish cunning woman/witch transported to Van Diemen’s Land for an as yet undecided crime. It will have supernatural themes: ghosts, spirits, magic, with the main conflict being her inability to connect with the spirits who helped her in her magical workings back in Scotland. Are there such spirits here, in colonial Van Dieman’s Land? And if so can how she connect with them? I’m halfway through my first novel for this challenge – Amanda Curtin’s The Sinkings – and I’m very impressed so far. The story has drawn me in, and I love Amanda’s descriptions of genealogical research. Having done quite a bit of my own I can say she’s captured perfectly the ups and downs of delving into the family history!